We recently acquired a male ornate flying snake from the Central Park Zoo in New York. Zookeepers hope he’ll breed with our female ornate flying snake. The ornate flying snake gets its name from the graceful way in which it moves. These snakes glide from tree to tree by controlled undulations of their bodies. Some say their movements, especially when they “fly” through the air, resembles flying squirrels! In the wild, ornate flying snakes live in Southeast Asia and eat lizards, snakes, bats and frogs. 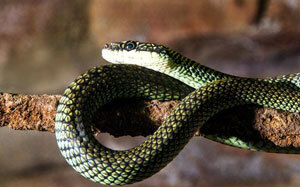 Visit our ornate flying snakes daily, in the Aquatic and Reptile Center.